Due to a scheduling conflict, Ozuna’s concert at Greensboro Coliseum originally slated for December 15, 2018 has been moved to Thursday, December 20, 2018. All previously purchased tickets for the December 15 date will be honored on December 20. Elite Media & Marketing, the producers of the tour, regret the inconvenience some ticket holders may experience due to the date change. Ticket holders that cannot attend the new concert date may request a refund at their original point of purchase. Tickets are available for sale at the Greensboro Coliseum Box Office or online at Ticketmaster.com. We take this moment to mention our gratitude to the Ozuna fans in North Carolina, your unconditional support over the years to Ozunaś career and the concerts we have produced in the state have been very important to the overall success. 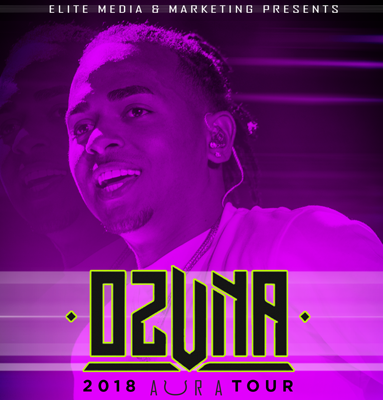 Ozuna´s highly anticipated #AuraUSAtour2018 will reach more than 30 cities in the United States before the end of the year. It features an extravagant use of smoke, pyrotechnics and state-of-the-art lights and LED screens. Taking advantage of his ample repertoire of hits from his maiden album “Odisea”, exciting collaborations with world renowned artists and fresh material from his latest album “Aura”, the beloved artist entertains his loyal fans singing a plethora of hit songs. For more information on #AuraUSAtour2018 see www.AuraUSAtour.com or https://www.facebook.com/AuraWorldTour/. Follow Ozuna in social media at YouTube, @OzunaPR on Instagram and Twitter.